In the hours before a NASCAR race starts, there’s a pulsating energy flowing through pit road. In the small inner expanse of the track you’ll find cars, haulers, equipment, pit boxes and motor homes and lots of people. It’s a jumble of human and mechanical NASCAR pieces, and if you’re anything like me at my first race, you might wonder what is going on here and what are all these people doing? To be honest, pit road reminds me of an ant colony. 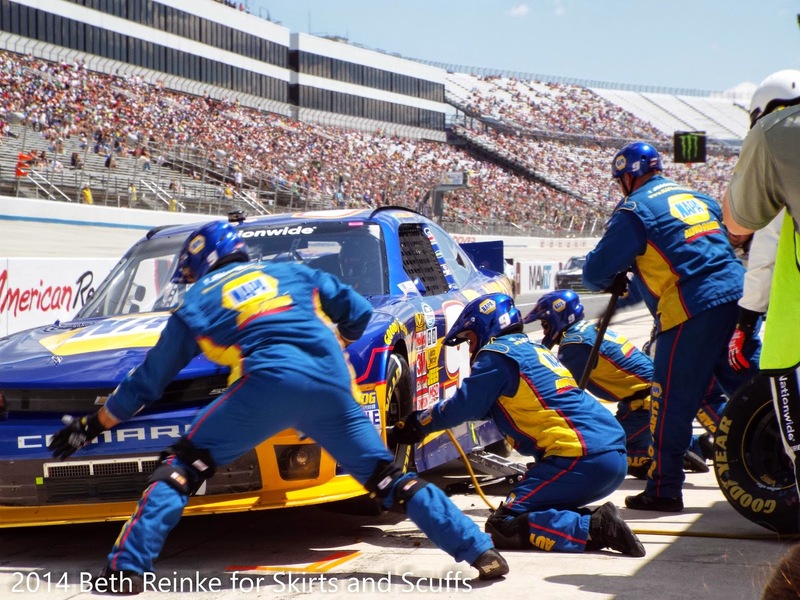 Pit crews are the infrastructure of a NASCAR race and do most of the rugged, raw labor. All sorts of visitors and VIPs walk pit road, but the integral crew members start their jobs hours before the race begins. You see them everywhere: in the garage working on cars, in the haulers prepping for the race or grabbing something to eat, steering vehicles for inspection or assembling pit boxes. It’s very organized; everyone has a role and they work quickly. The steady buzz of activity continues to intensify as the race draws near. The work of a pit crew doesn’t slow down with the wave of the green flag. After spending hours getting ready, they’ll be in pit boxes during the race for crucial pit stops which seem to happen at the speed of light. In 12 seconds or less, a pit crew can refuel a car, change tires, perform other maintenance work and send the driver on his or her way. The concrete barrier that sits between the pit box and the racetrack? They jump over it for each pit stop, or go "over the wall." With the adrenaline, pace and physical nature of the job, it’s no wonder many pit crew members are former college and pro athletes. Carries tire from behind wall for tire changer and makes other adjustments to car as needed. The Rear Tire Carrier carries tires for the rear of the car and the Front Tire Carrier carries them for the front. The No. 9 Xfinity Series pit crew in action, May 2014 at Dover. Starting on the right side, rear of vehicle, takes off the old tire with an air-powered impact wrench. He or she must remove all five lugnuts, replace the tire, then move to the other side of the car and do the same for the left tire. The Rear Tire Changer changes the car’s rear tires while the Front Tire Changer changes the car’s front tires. Raises the car for tire changers using a hydraulic jack that weighs 20 pounds. He operates the jack first on the right side, then the left. As a result, you’ll see each side of the car seemingly suspended in the air for a few seconds. Hauls two cans of Sunoco Green E15 fuel over pit wall -- each holding 12 gallons and weighing approximately 81 pounds -- and refuels the car. Support crew can assist the six crew members from behind the wall by handing them various equipment such as fuel, wrenches, tires and tools. The esoteric, ever-changing game plan of a crew chief, car chief, driver and pit crew may be difficult to follow but is based on the track, car and tire conditions, length of the race, fuel needs and a number of other factors. I’d be remiss not to mention team engineers, who compute all kinds of information for the setup of the car including shock, spring and tire specifics. One thing I remember from school is that laboring ants communicate through chemicals when they connect their antennae to one another. I don’t think the same method of communication holds true in racing, but it’s evident that most pit crews are linked by what seems like an innate ability to maintain a laser focus in their jobs. Go to a race, and you’ll see it in action. For more information on how pit crews work during a pit stop, visit NASCAR.com.